At Volunteer Toronto, we understand that Volunteer Managers often need to juggle a lot of different responsibilities on a tight timeline to be able to keep their volunteers happy and their programs thriving. Our Volunteer Management Resources are designed to make your job a little bit easier. Whether you want an in-depth workbook to help you learn a new skill, or a simple template that you can quickly adapt to your needs, Volunteer Toronto has you covered! 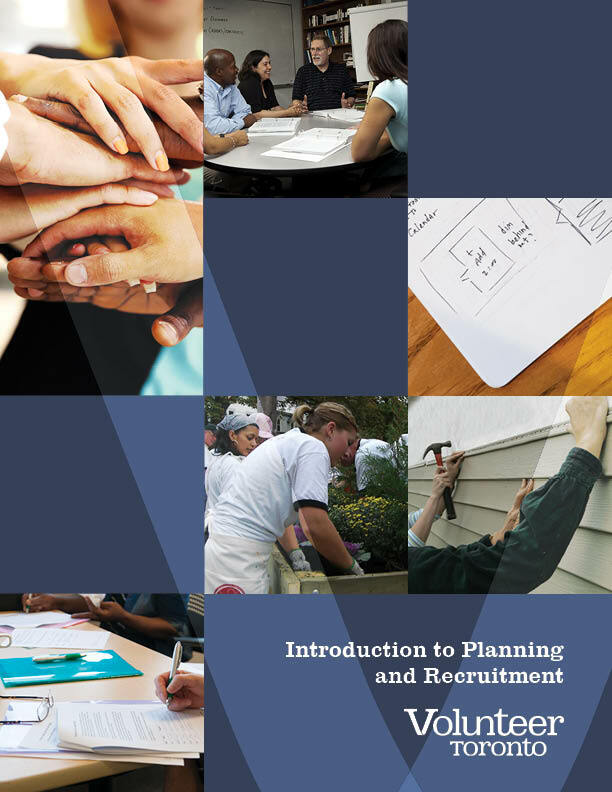 From your volunteer's first orientation to additional training throughout their engagement, this workbook has you covered with an in-depth guide to planning orientation and facilitating excellent training sessions. All the tips, tools and techniques you need to effectively train your volunteers can be found in this month's featured resource, FREE until April 30th, 2019. Learn about 8 unique platforms and the steps you should take to find the right tool for your organization. Explore cost options, add-ons, user-friendliness and more in this new resource, plus find out about other Toronto organizations using these tools that you can connect with! Get started with planning volunteer roles, recruiting effectively and considering the right approach for group volunteering. Understand your coaching style, become an amazing supervisor and gain a deeper understanding of motivation with this resource guide. From recognition to program evaluation, "impact" is the key to volunteer success. This resource guide can help you get started. As volunteer managers, how can you advance your career? Learn about professional development, schooling options, and more in this resource guide. How can you effectively engage newcomer volunteers? What barriers do newcomers face when finding meaningful volunteer roles? This one page resource highlights amazing outcomes of engaging newcomers and barriers you can address to increase access to your volunteer opportunities. What is informal volunteering? How can you identify and work with informal volunteers? This one page resource highlights recent research, growing trends and great examples of informal volunteering. Looking for ideas on how to recruit for and connect with youth volunteers? This one page resource features important tips and valuable insight from youth volunteers, Volunteer Toronto research and Volunteer Canada resources. 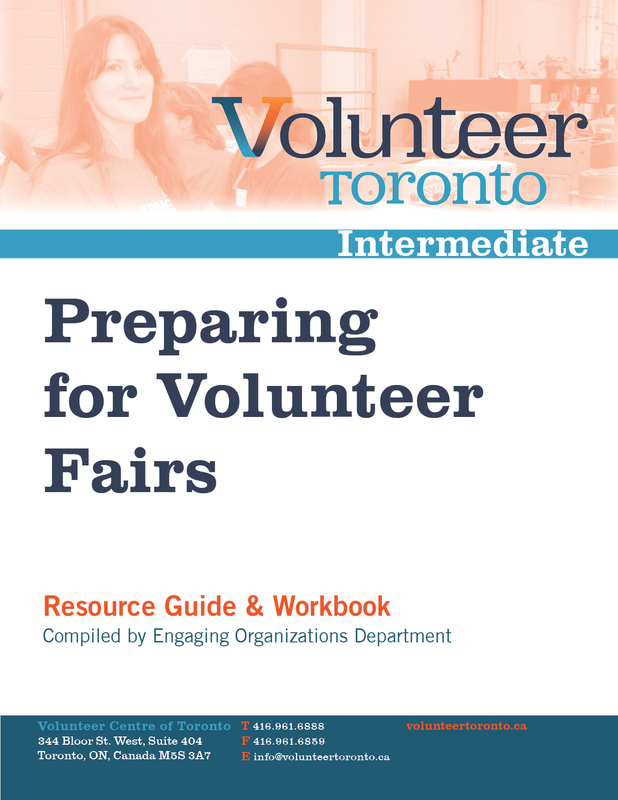 Get ready for volunteer fairs with ideas, checklists, examples and more in this workbook. From "booth etiquette" to "the role of technology," this resource guide has you covered before, during and after volunteer fairs. 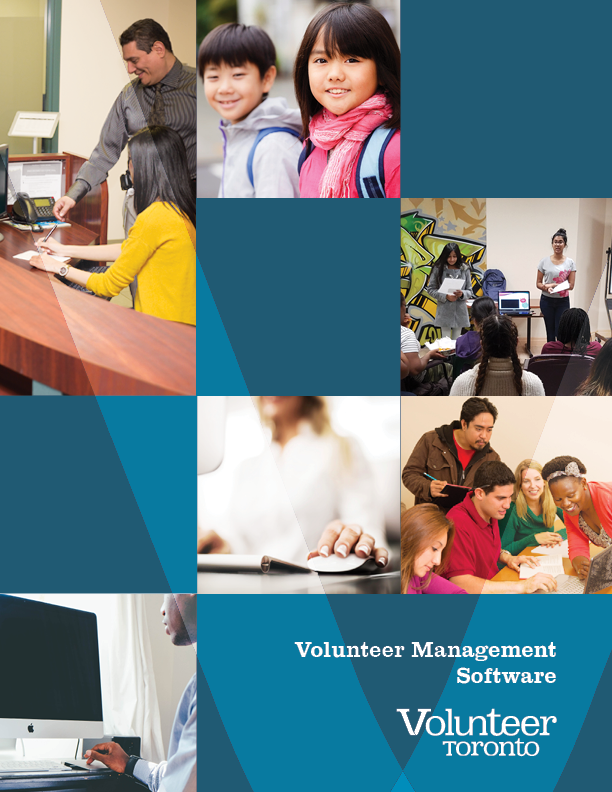 Start the volunteer management journey with this workbook, which includes templates, surveys, checklists and more to get volunteer ready. Plan and promote your volunteer recruitment with this workbook's thorough strategy guides and checklists. Plus, learn more about specific audiences including youth, seniors and newcomers. To help you screen and select the best volunteers for the role, this workbook includes tools and tips to make your interview and screening process clearer and easier. From your volunteer's first orientation to additional training throughout their engagement, this workbook has you covered with an in-depth guide to planning orientation and facilitating excellent training sessions. Choosing the right supervisor, having an appropriate reporting structure, keeping track of projects and even overseeing off-site volunteers are all important aspects of volunteer supervision. This workbook includes tools to help you improve volunteer engagement and supervise your volunteers effectively. Recognizing your volunteers is one of the best ways to increase retention. This workbook includes tools and templates to help you minimize burnout, increase retention and provide valuable recognition to your dedicated volunteers. This workbook provides templates, tools and tips to help you identify and minimize barriers your potential and current volunteers may be facing. Learn more about who might encounter barriers, how volunteers can overcome them and why removing barriers can increase the diversity and impact of your volunteer program. 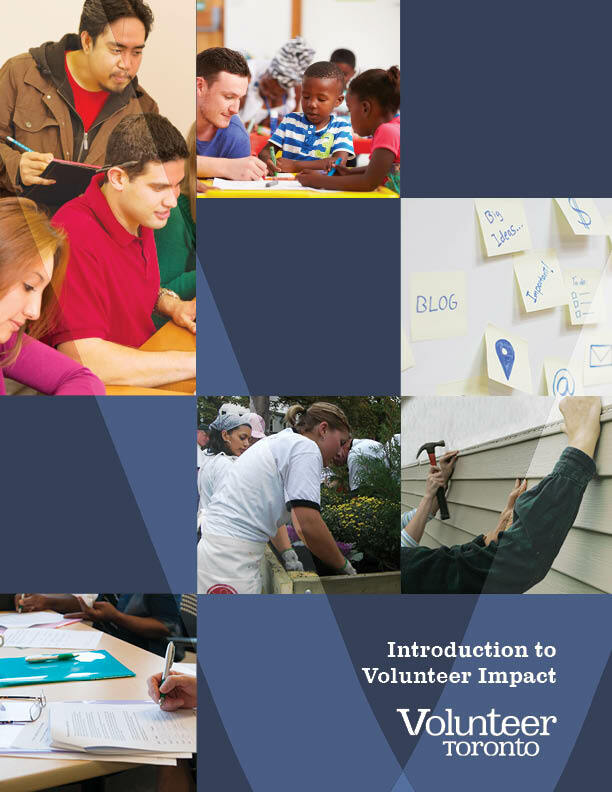 This workbook explores the development of volunteer communities to keep volunteers engaged and connected, along with the tools to develop a mentorship program to help volunteers learn from each and grow. This workbook is a full volunteer handbook with annotations and notes to help you develop and/or update your own volunteer handbook. The workbook is guided by Paperguy and includes necessary policies, legally-required statements and other recommended inclusions. This workbook will help you create meaningful, lasting boundaries for volunteers - and understand why those boundaries might be broken. Dismissal can be a potential consequence for breaking boundaries, and this workbook explores best practices in creating dismissal policies. Long-term or "ongoing" volunteer roles are a vital part of many volunteer programs. This workbook includes guides, templates and promising practices for engaging and working with long-term volunteers, including case studies from Toronto organizations. Short-term volunteering is one of the biggest trends in volunteer management. This workbook features guides and templates to help you deal with the challenges of engaging short-term volunteers, get better prepared for engaging them effectively and learn some promising practices from Toronto organizations. From evaluations to performance coaching, this workbook features a number of handy templates and guides to help you give valuable feedback to your volunteers and coach them to better performance. Your organization has specific obligations to be accessible for clients and volunteers with disabilities. Make sure you're fully compliant with the Accessibility for Ontarians with Disabilities Act with this handy workbook. Original research by Volunteer Toronto on volunteer-run organizations in Ontario. 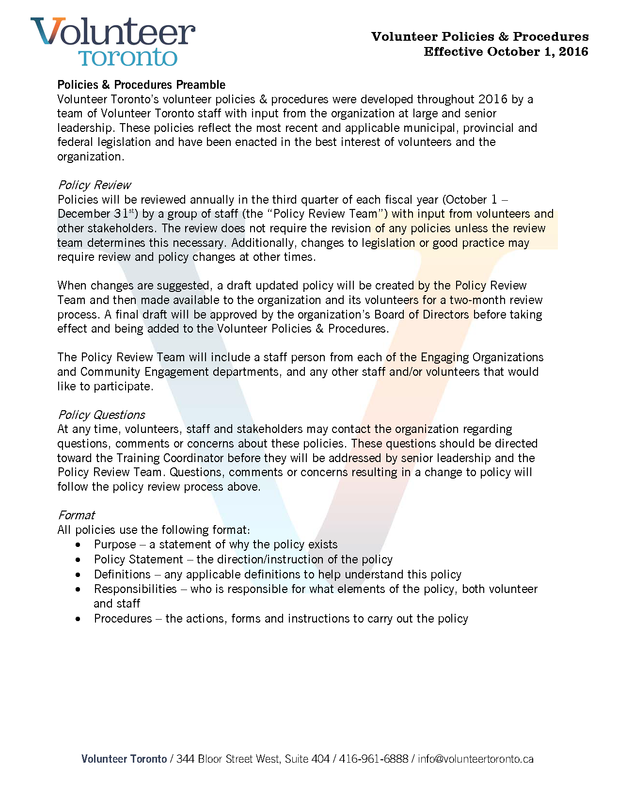 This resource centre features all of Volunteer Toronto's currently active policies & procedures for volunteers - feel free to use these as examples and templates for your own volunteer policies & procedures! The Report from the 2018 VECTor Conference has arrived! Now you can learn what happened at the Conference, explore the workshops and discussions in detail and check out some amazing takeaways in this free. Don’t miss some amazing insights into the state of volunteering in 2018 and ideas for the future of volunteer management. The Report of the November 8th, 2017 VECTor Conference. Features presentation summaries, research highlights and Discussion Group ideas. Download the Report for great resources and interesting new tools to help you be more innovative and conduct your own research. The report of the November 2nd, 2016 VECTor Conference for volunteer managers and coordinators. Features presenter highlights, research findings, ideas from group discussions and useful tools. Learn more about youth volunteering trends, creating and applying innovations in your volunteer programs, volunteers with court-ordered community service and more.